Need a snack with kid appeal? 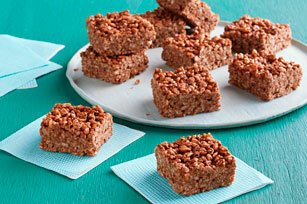 Try these crispy treats flavoured with peanut butter and chocolate. Microwave peanut butter in medium microwaveable bowl on HIGH 1 min. ; stir. Add cereal; mix well. Press onto bottom of parchment-lined 8-inch square pan. Refrigerate 30 min. or until firm before cutting into squares. Use additional parchment paper to press cereal mixture onto bottom of prepared pan. The parchment will help prevent your hands from sticking to the cereal mixture.